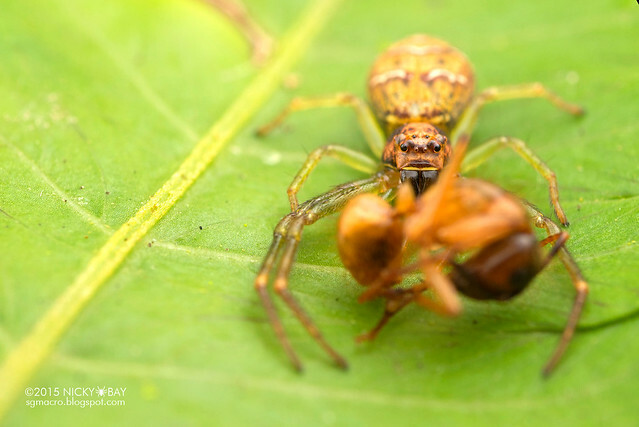 From my recent week-long stay in the Peruvian Amazon, I found and photographed almost 200 spider specimens and other fascinating micro fauna, with over 500 shortlisted photos from spiders alone. 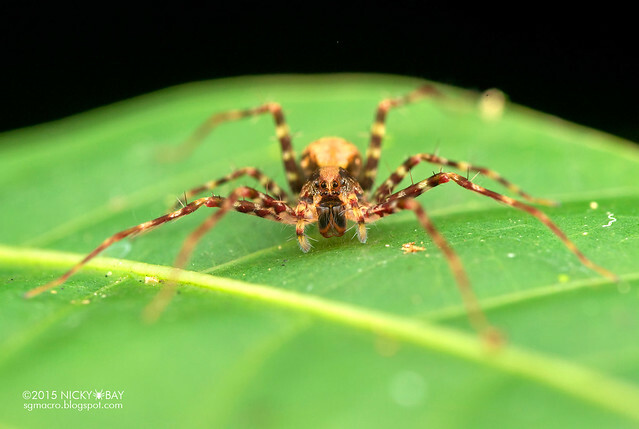 It would be an overkill to publish all the shots in a single post, yet I wanted a way to showcase the diversity of spiders witnessed from simply eyeballing around in the tropical rainforest. 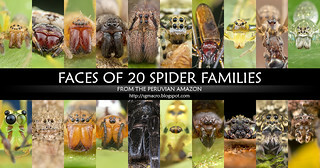 In this post, I will showcase a selection of faces of all the families of spiders that I've witnessed in the week. 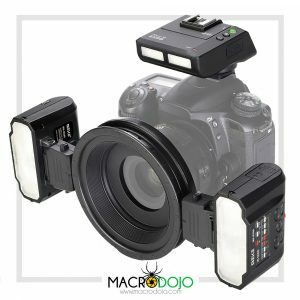 Many macro photographers love to take pictures of the subject's face, leaving the rest of the body out of focus. 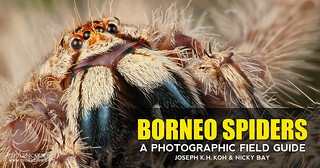 The difficulty for such shots is obviously high, as the photographer needs to get to the level of the spider and go much closer, while hoping that the spider doesn't move or turn away. 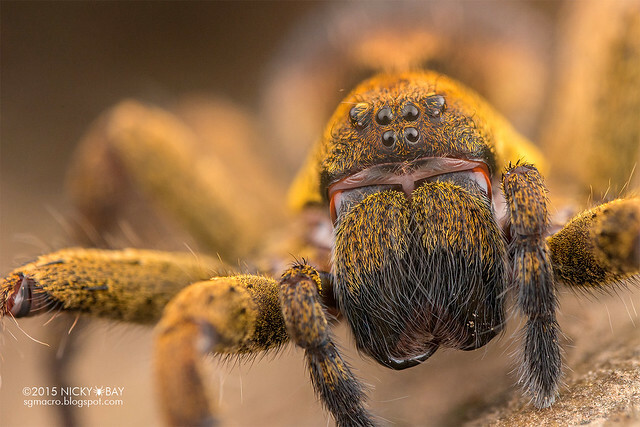 Eye closeups are not necessarily a bad thing for spiders, as it reveals a lot of information on the eye arrangement. 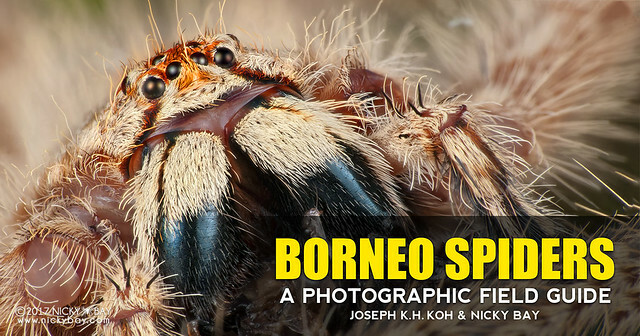 However, shots like this are also increasingly frustrating for many arachnologists. For a better chance of getting the subject identified, various angles are needed. Many a time, identification requires examination of the specimen under a microscope and sometimes dissection might even be required. 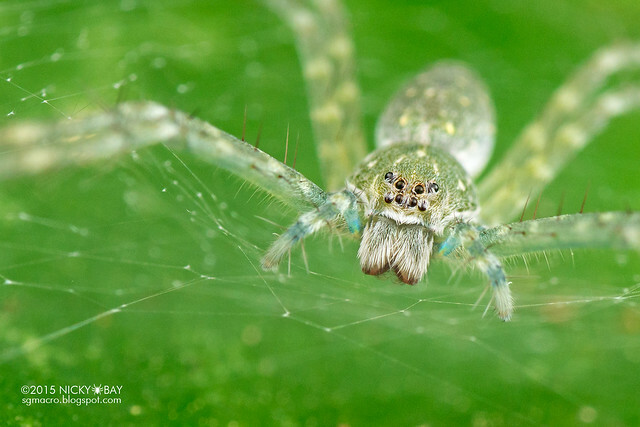 That is why many identified spiders on the internet are potentially inaccurate. 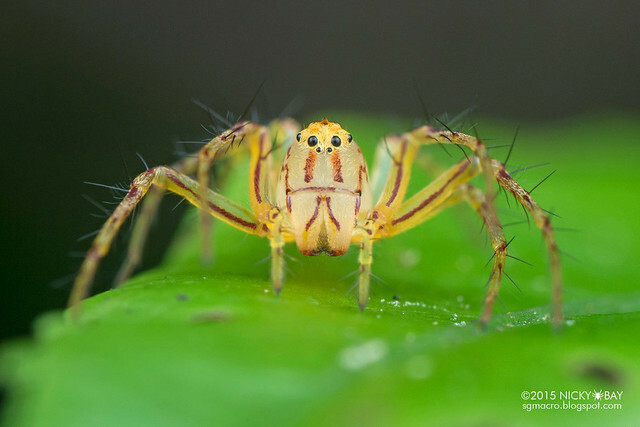 Thanks to Rainforest Expeditions for arranging the trip, Jeff Cremer and Vico Moscoso for covering the trails with me, and Pedro H. Martins for most of the spider IDs! Good news if you are interested to make trips to Tambopata - readers of this blog can get a 10% discount from bookings to the Peruvian Amazon via Rainforest Expeditions - just mention the discount code SGMACRO when making your reservations! 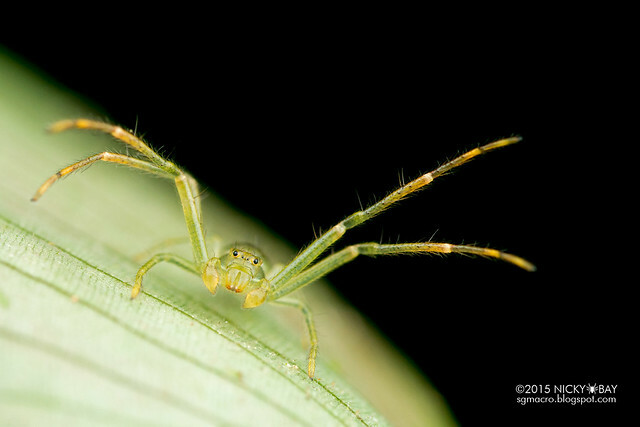 Looks similar to clubionids, but differentiated by spiracles near the center of the abdomen's ventral surface. Unfortunately not visible in these photos. 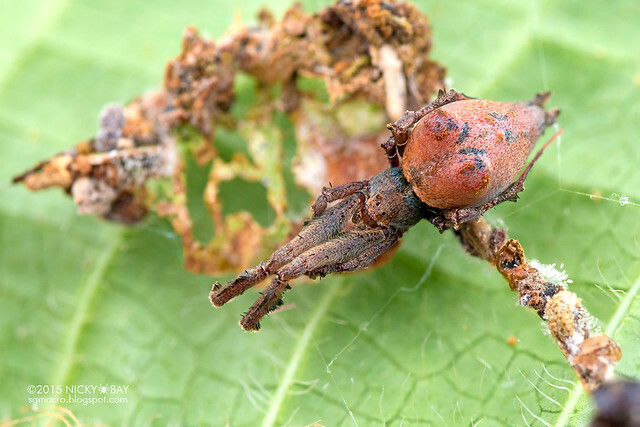 Typically found hiding under a sheet of silk, similar to clubionids. 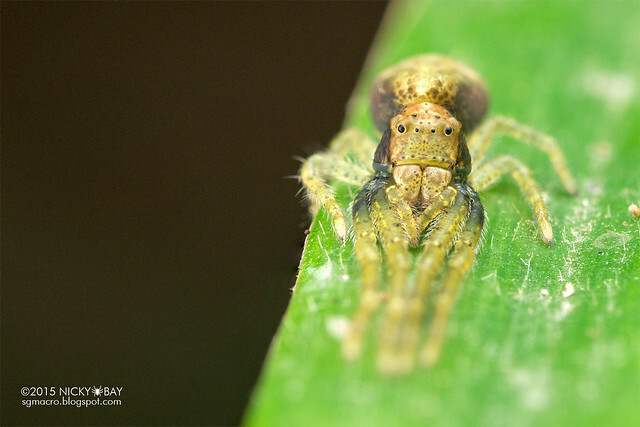 This is an adult male with part of the palpal structures visible. View of the ocular region shows 6 eyes in the bottom row, and 2 on top. Check out the dorsal view. Chelicerae and carapace partially black, unlike the earlier specimens. Check out the dorsal view. 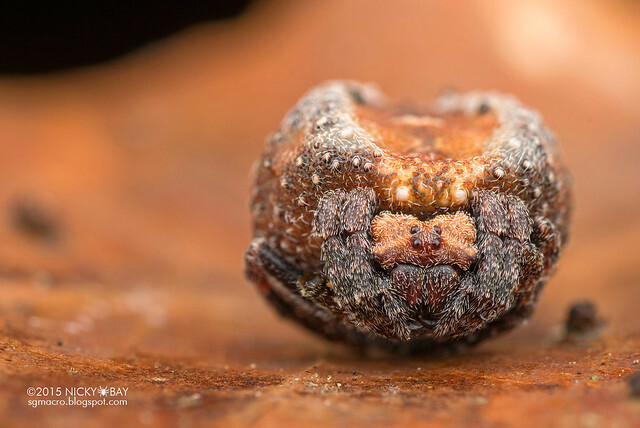 Hypognatha is also a tiny, but super adorable genus with an abdomen shaped like a turtle-shell. Check out the dorsal view. 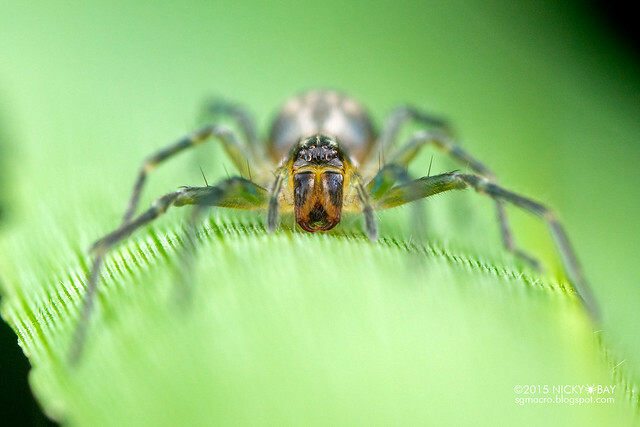 This spider is shaped like a heart and exceptionally thin with numerous lateral spines on the abdomen. 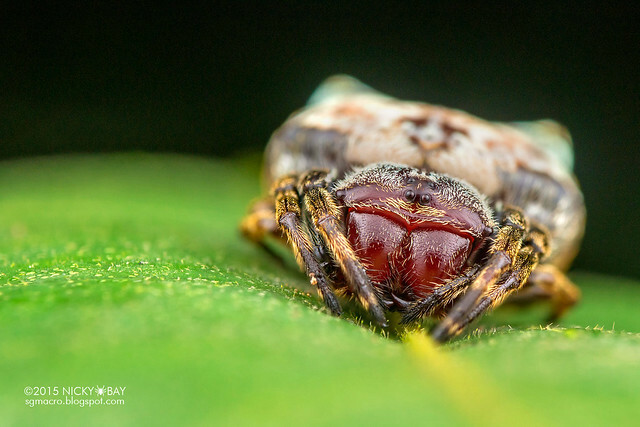 More shots and detailed observations have been posted here: Peruvian Amazon's Thorned Heart and Other Thorn Orb Weavers. 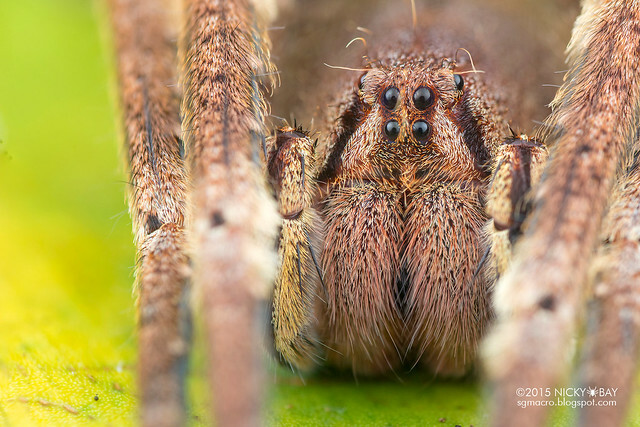 A chunky orb weaver with huge chelicerae. At certain angles, it resembled a teeny bit like bird poop. Check out the dorsal view. Notably different from the ones in Singapore. Check out the dorsal view. 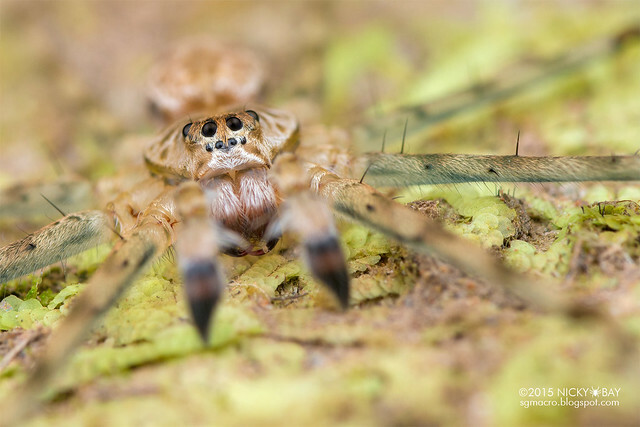 One of the most stunning spiders from this trip! 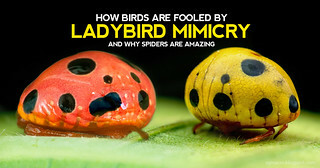 Is it mimicking a ladybird? 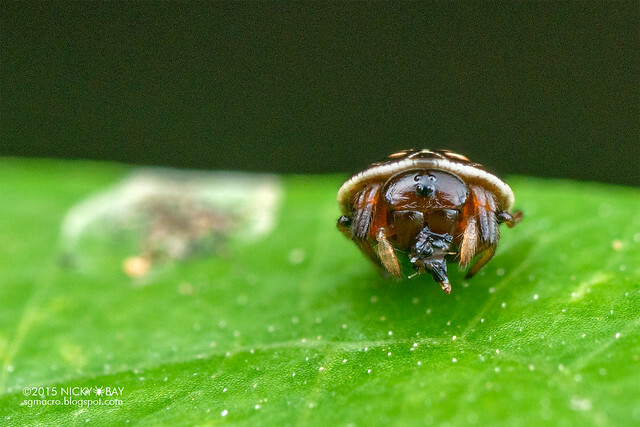 More shots and detailed observations have been posted here: Adorable Tortoise Orb Weavers from the Amazon. Alpaida exhibits notable sexual dimorphism. Check out the dorsal view. The corresponding female is much more colourful! 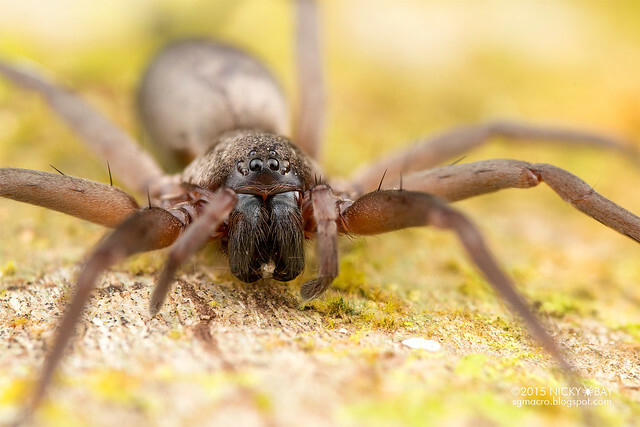 Verrucosa is an exceptionally intriguing genus with numerous bumps on the abdominal posterior. Check out the dorsal view. 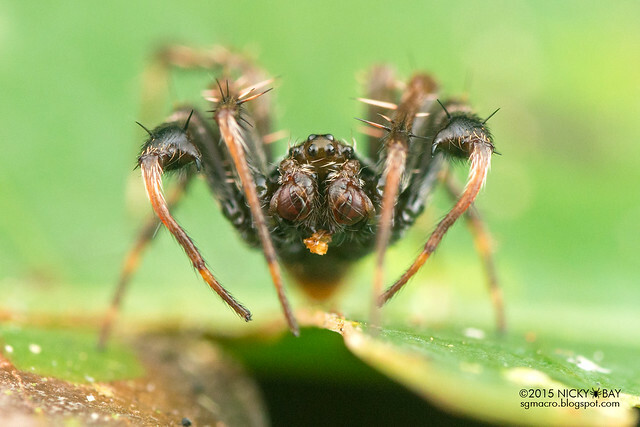 The male Verrucosa looks like a smaller version of the female, with the posterior bumps prominently displayed as well. Check out the dorsal view. Wagneriana is very commonly seen, but not often photographed as it looks very dull at first sight. 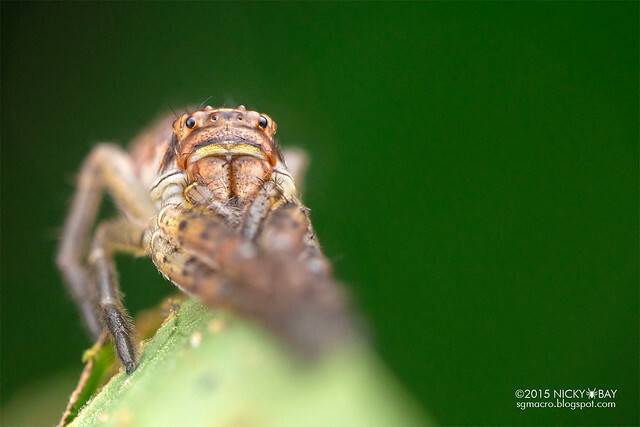 The numerous abdominal spines are not obvious until looked up close, and almost non-existant on males. Check out the dorsal view and the female, as well as a more colourful variant. Acacesia is seemingly rare, but I was lucky to see one weaving her egg sac. Check out the dorsal view. The clubionids that I saw in the Amazon look very similar to the ones in Singapore. 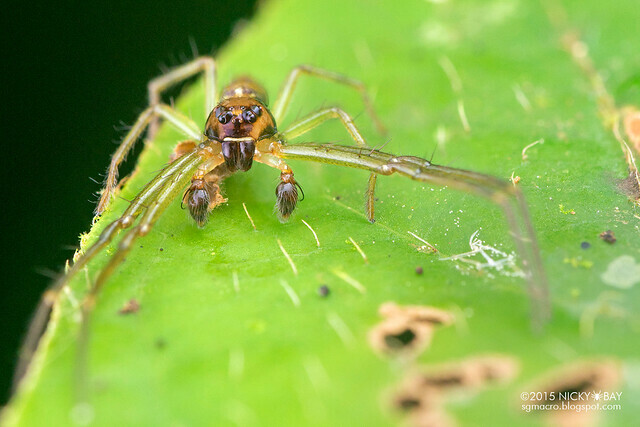 A specimen with red chelicerae and longer legs. Note the 6 eyes in the bottom row, and 2 eyes above. Check out the dorsal view. 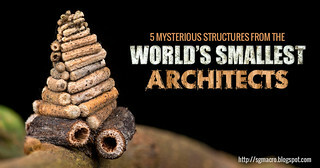 The specimens that I saw were not exactly ant-like, and were all found on tree trunks. Typical corinnid eye arrangement. Check out the dorsal view. This has a slightly higher clypeus. Check out the dorsal view. 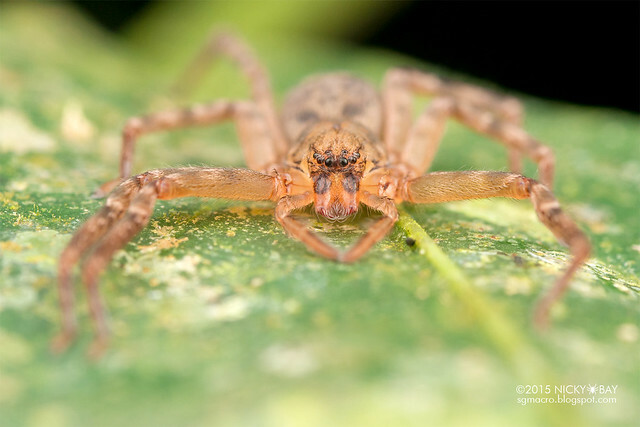 The famed Brazilian Wandering Spider belongs to this family, and I did see several Phoneutria in this week! Some were spotted on branches. Check out the dorsal view. This ctenid was very cooperative and allowed me to go very close. 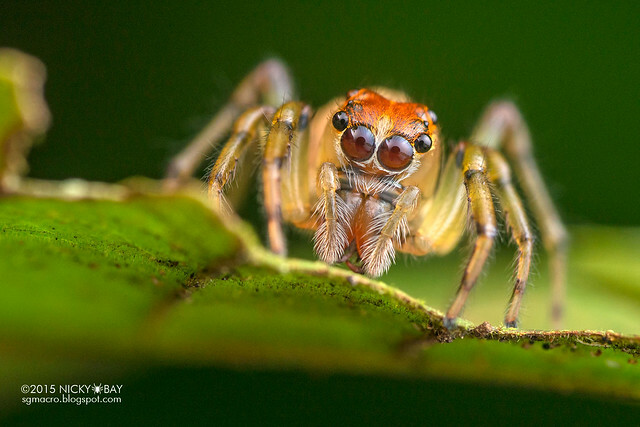 Check out the dorsal view which reveals several regenerated legs. 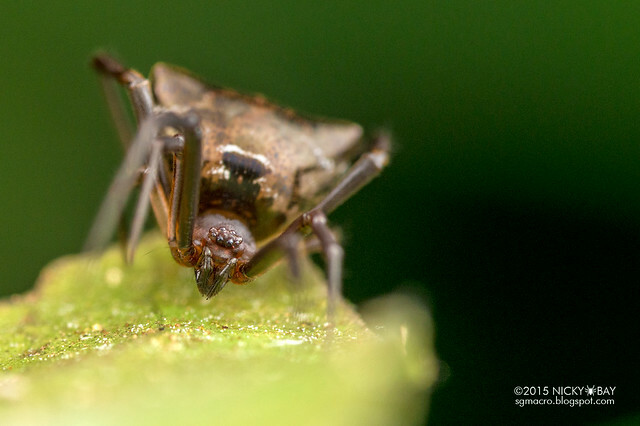 Despite standing up with legs outstretched, this Enoploctenus stood still enough for me to take several closeups. Check out the dorsal view. 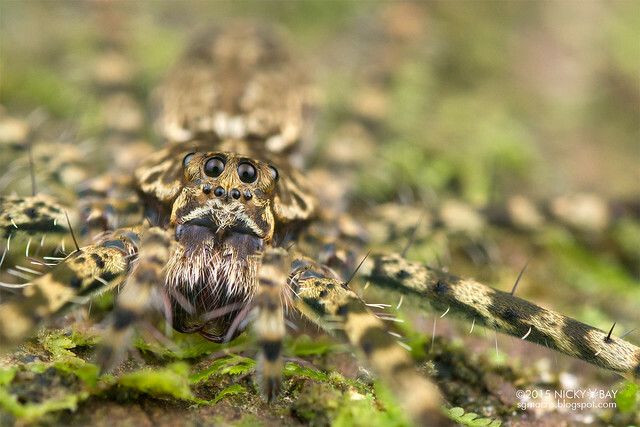 The is the infamous Brazilian Wandering Spider which packs a dangerous bite. However, they are relatively tame and will choose not to bite humans unless provoked. 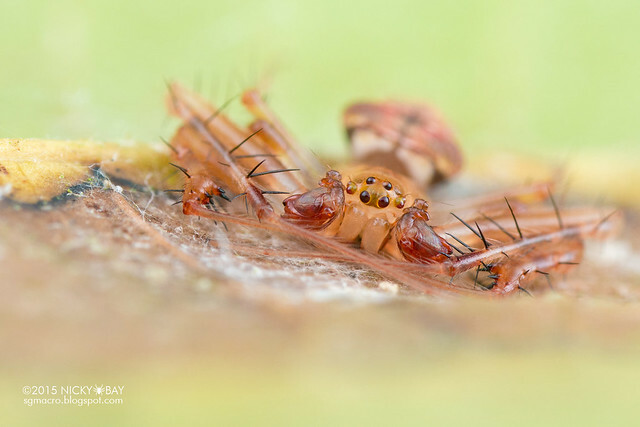 I also managed to shoot a mother guarding her spiderlings, with probably the most number of wandering spiders you'd ever see in a single photo. A beautiful and large Ctenus resting on a little piece of rock allowed me to go on the ground to get a nice angle of its face. Check out the dorsal view. 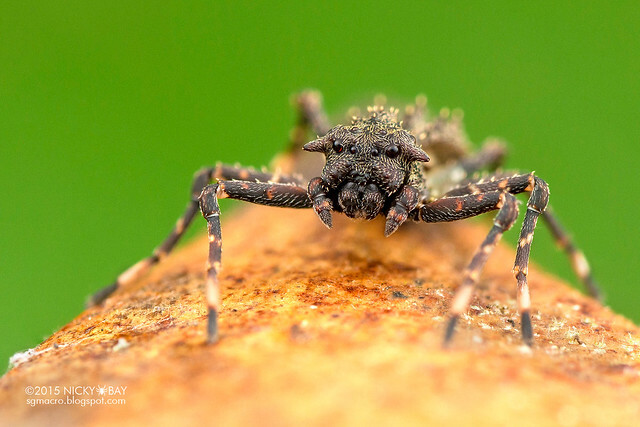 A tiny but handsome ctenid scampering around on a tree trunk. Check out the dorsal view. A commonly seen family in Singapore, so it would be interesting to see how differen these were in South America! The ocular quad appears to be much bigger than their Singapore counterparts. Check out the dorsal view. 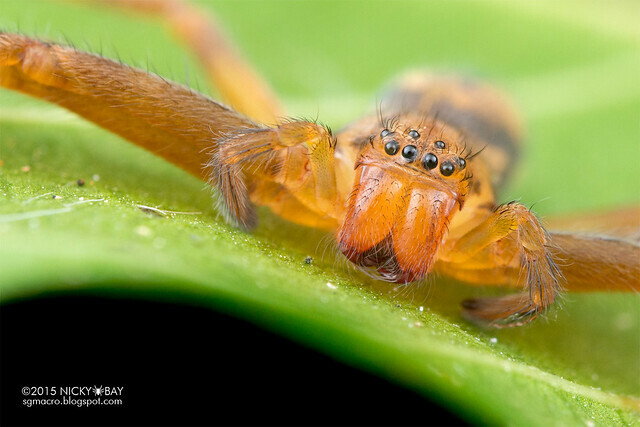 One of the most visible orb weavers due to its immense body and web size. It is rare to get a shot of a Nephila's face in its natural pose, so this looks a little awkward. Perhaps it might be preparing to moult? There were familiar oxyopids around, but Schaenicoscelis was very new to me! A small but lovely genus. Check out the dorsal view. 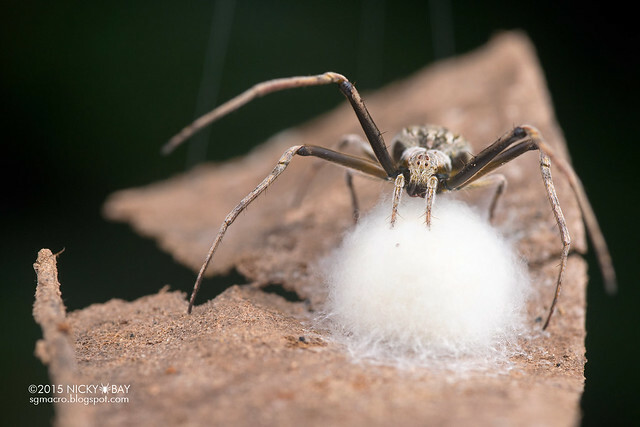 This relatively large Schaenicoscelis was carrying her egg sac - a behavior unlike other oxyopids which would typically weave egg sacs on a leaf. Check out the dorsal view. I saw many pholcids on this trip, but did not take as many shots. Quite a neglected family by photographers, due to the size and difficulty in getting a good composition. 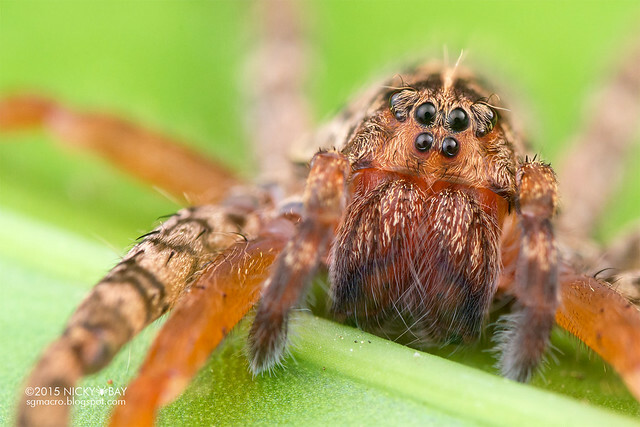 The problem with male pholcids, is that the enlarged palps would almost always be blocking the eyes from a frontal view. Hence a view of the eyes from this angle. 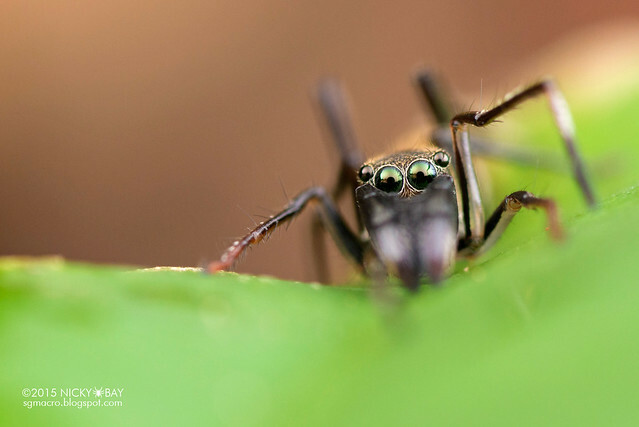 Did you know that some males have their eyes on eye-stalks? 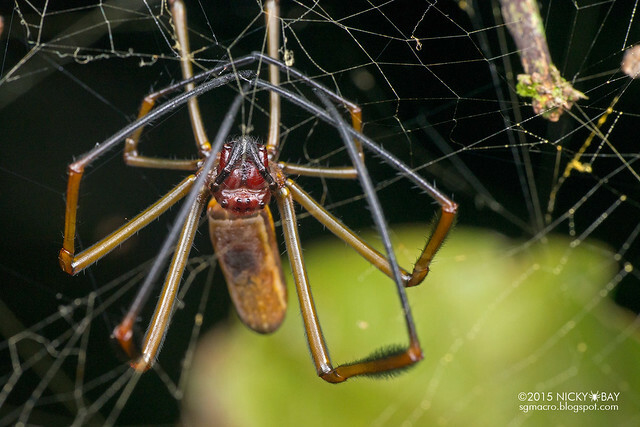 Despite the name, not all members of this family may weave nursery webs. This green pisaurid is commonly seen perching on top of leaves. Check out the dorsal view. This pisaurid tends to position itself at the edge of holes within leaves. 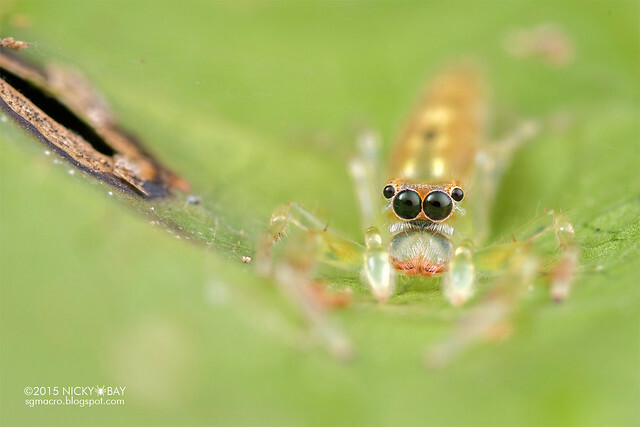 When threatened, it could quickly move to the other side of the leaf. Check out the dorsal view. This Architis has very distinctly banded legs, and the photos do not do it justice. Check out the dorsal view. 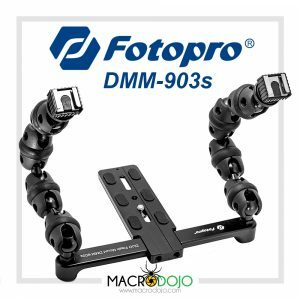 This is THE family where shots of the eyes are almost mandatory for any macro photographer. 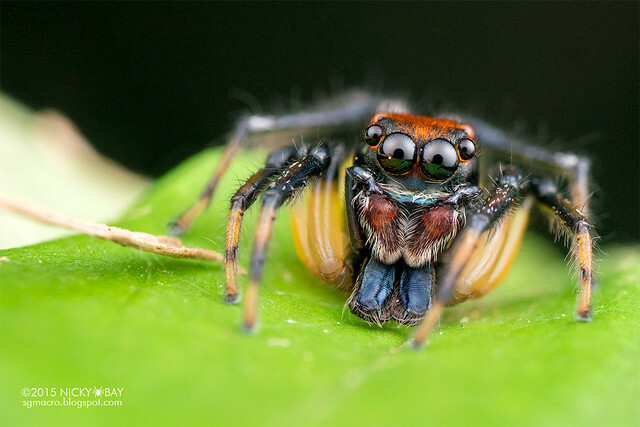 Probably the cutest spiders with the overly large anterior median eyes. A sub-adult male, really tiny specimen. Check out the dorsal view. 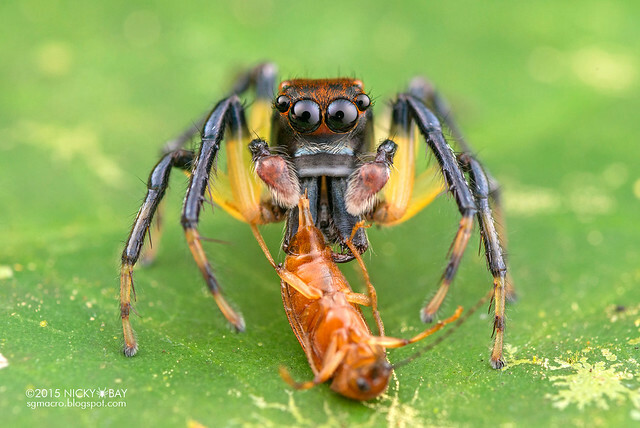 A typical ant-mimic jumping spider with enlarge chelicerae blocking its face. Check out the dorsal view. Possibly gravid or just taken a heavy meal, as the abdomen was really swollen. Check out the dorsal view. 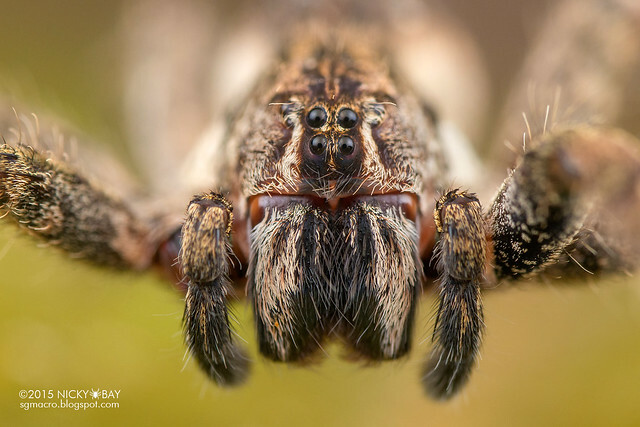 This large jumper was found on a tree trunk. Check out the dorsal view. 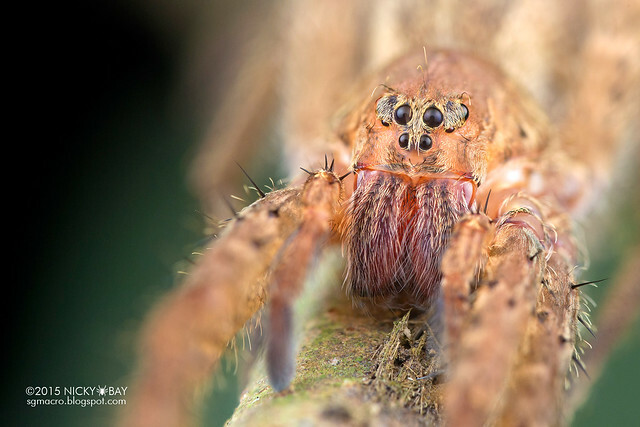 Another large jumper found in the mangroves. Check out the dorsal view. 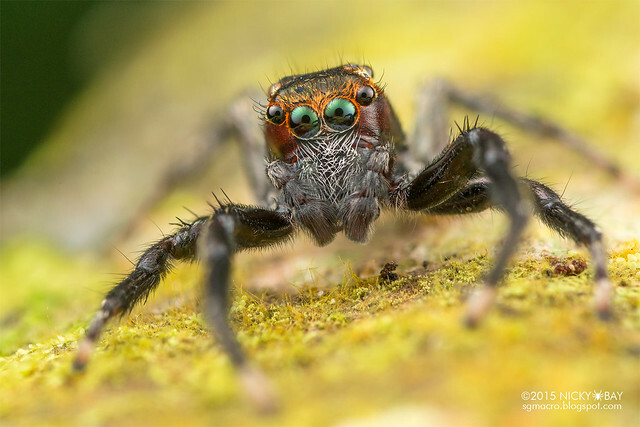 A really "angry" looking salticid that was found together with a female. 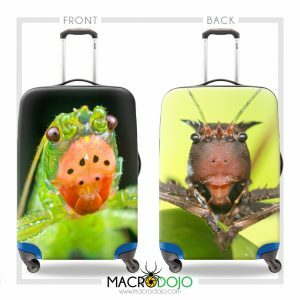 Check out the dorsal view of both male and female together. 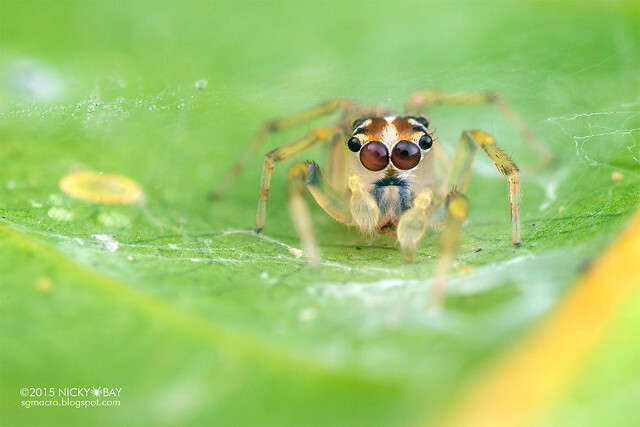 Lyssomanes has large anterior lateral eyes positioned just above the anterior median eyes. 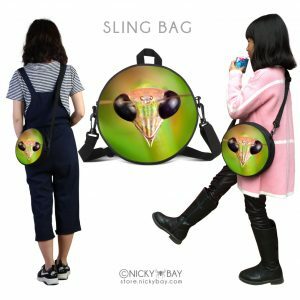 Looks really funky! Check out the dorsal view. 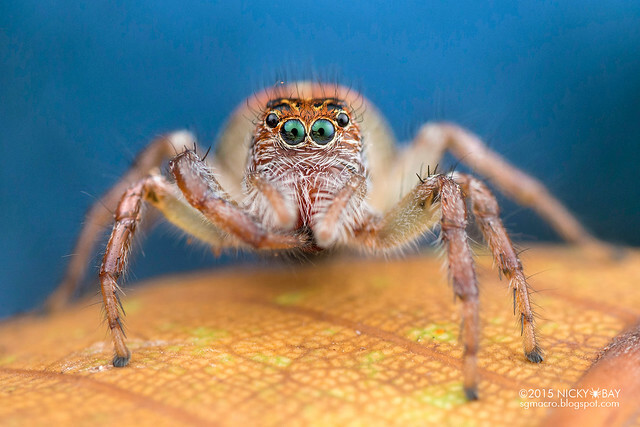 This stunning jumper was so heavy that I could feel a thud when it landed on a leaf. Check out the dorsal view. 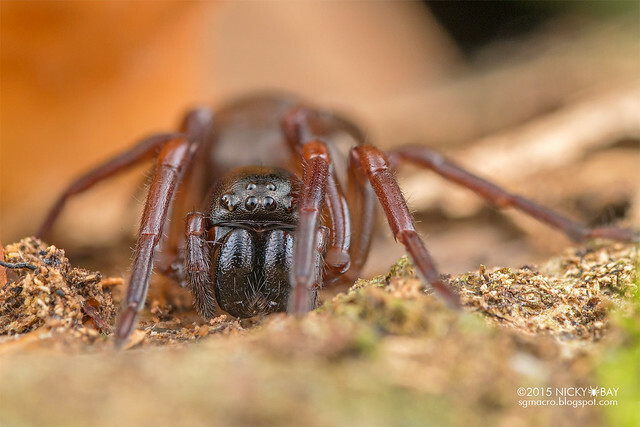 A shy adult male, hiding its exceptionally long chelicerae. Check out the dorsal view. 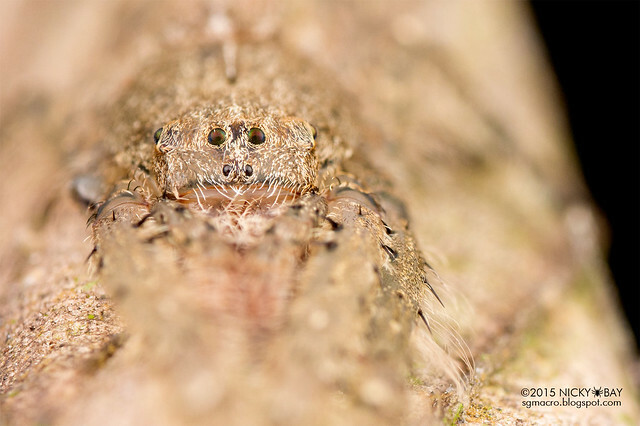 This is an example where the anterior view does not do the spider justice. 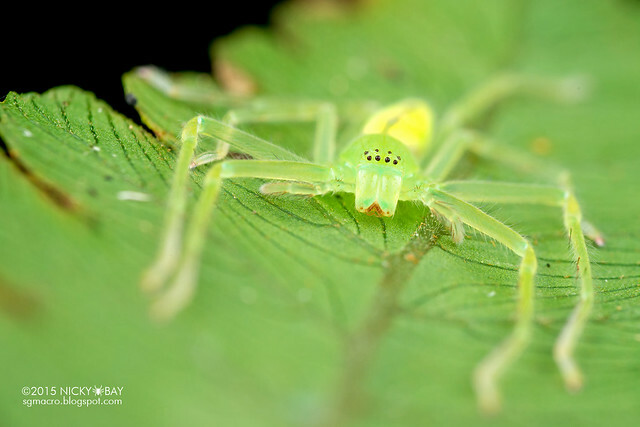 You really must see the dorsal view to see the metallic green body. 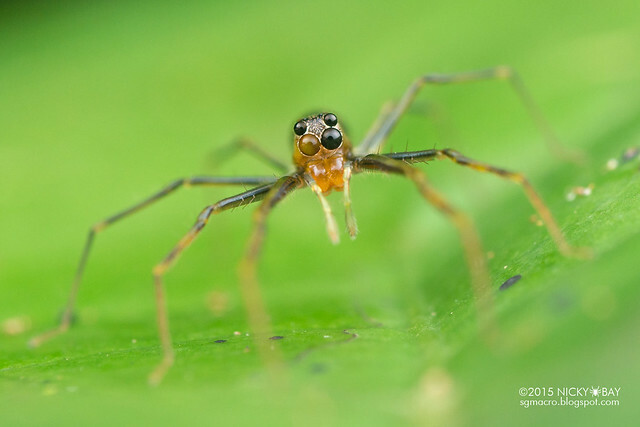 A male Lyssomanes! Not as colourful as what I expected though. Check out the dorsal view. 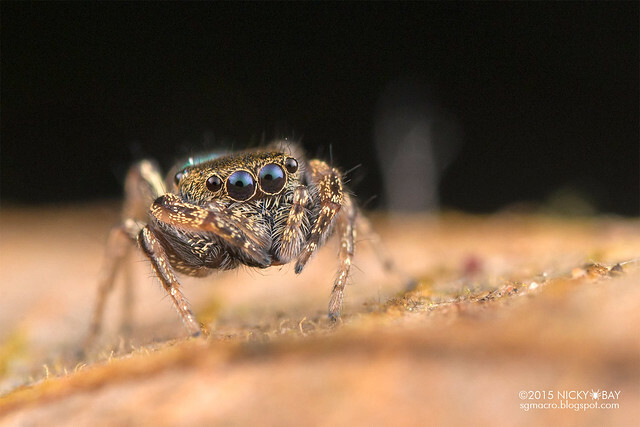 Really really tiny salticid, also possibly a sub-adult male. Check out the dorsal view. Lyssomanes was found to be in abundance, but I just took a record shot of every one that I saw. Check out the dorsal view. Interesting looking sub-adult male with a lanky abdomen. Check out the dorsal view. 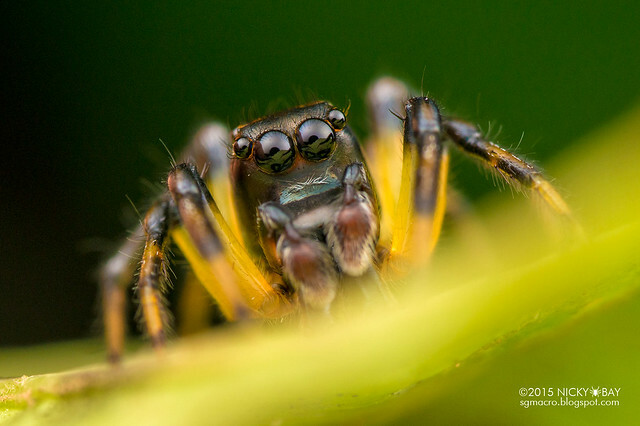 Found another shy salticid, but this time revealing part of its long chelicerae. Check out the dorsal view. 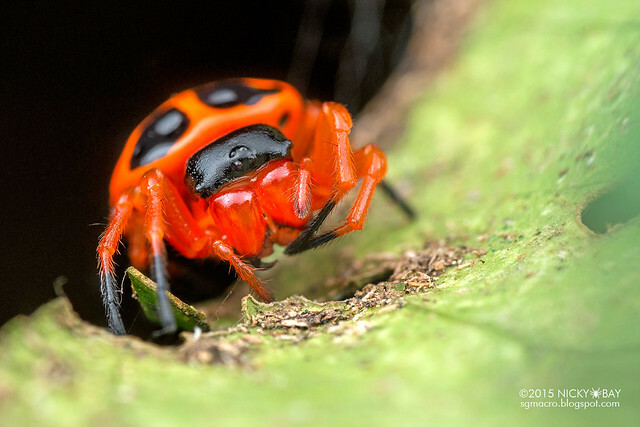 You must see the dorsal view of this Asaracus, the abdomen is streaked with vibrant red! Quite a rare family. 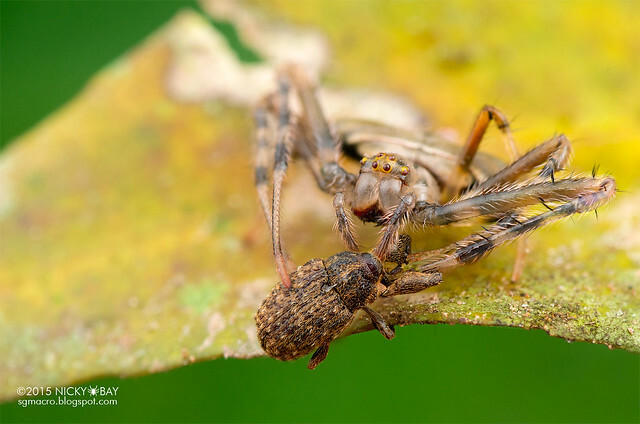 The spider suspends a dead leaf in its web and hides on the leaf. Weird looking eye-arrangement, unlike any that I've seen before. Check out the dorsal view. 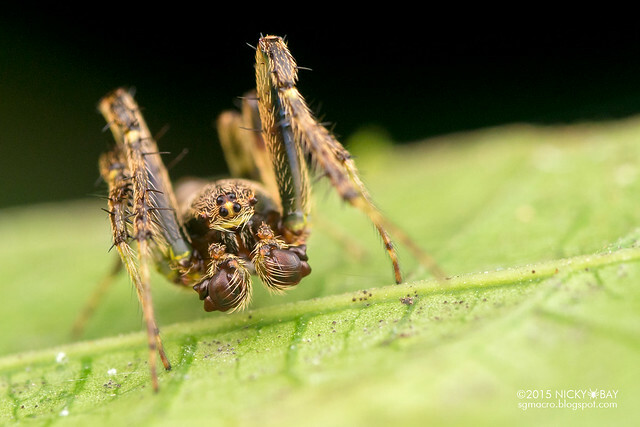 These are active nocturnal hunters, usually larger than other typical spiders. However, I've only seen the smaller ones in this trip. Found on top of a leaf, but quick to retreat under the leaf when I approached. Check out the dorsal view. 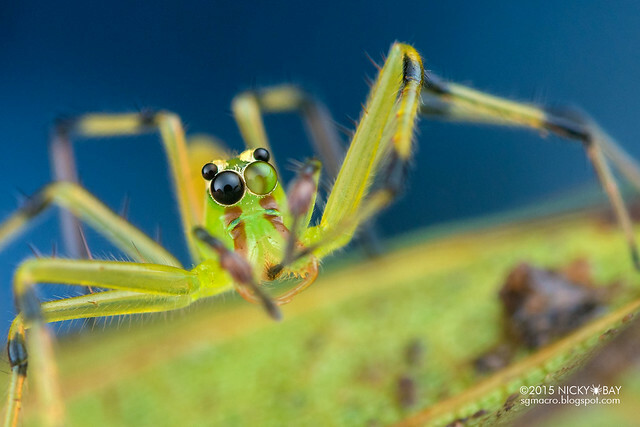 The eyes on this are much smaller than a typical sparassid. Check out the dorsal view. A relatively common genus, Olios is usually found in the foliage. Check out the dorsal view. Several different specimens of tetragnathids were spotted in my walks. In fact, it was the most abundant family during my walks. Somehow because of that, I took it for granted and did not take close ups of the eyes. Probably the most famous spiders across the world. 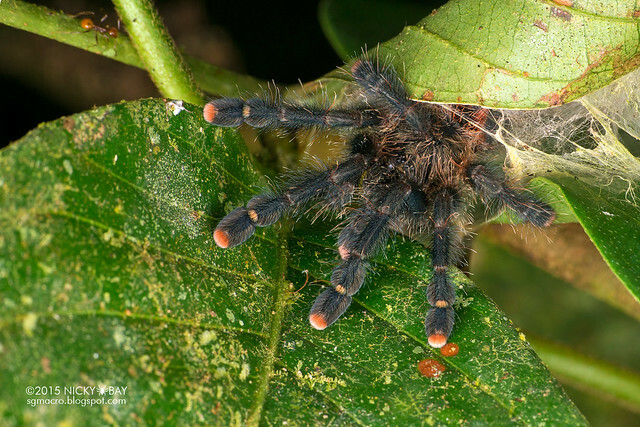 Usually very hairy and can grow up to significant sizes, the tarantulas in the Amazon appear to be more bold than those in Singapore. They were very willing to come out from their burrows in search for food. 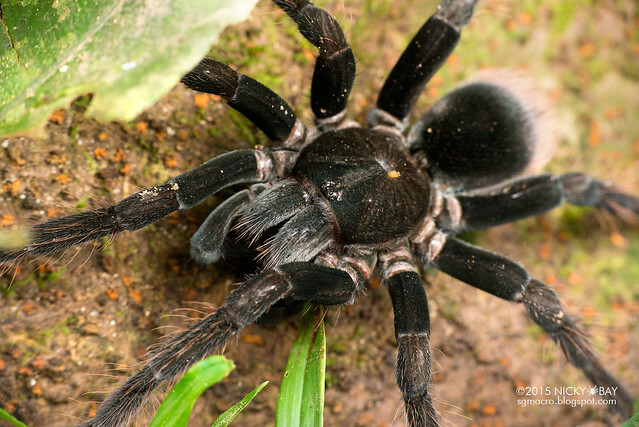 Some tarantulas were very docile and allowed me to go really close. Check out the dorsal view. This handsome red-rump had its burrow at the base of a tree, and was found chilling just at the entrance. Check out the full dorsal view. 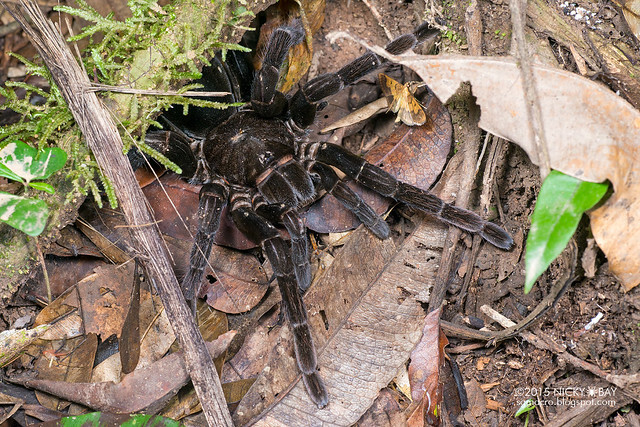 This pink toe tarantula had its burrow within rolled up leaves just in front of the lodge. It is said that they preyed on hummingbirds. WHY chicken tarantula? Natives said that these spiders ate their chickens. Nobody has witnessed such a scene before though. Check out this scene of the mother with her babies! 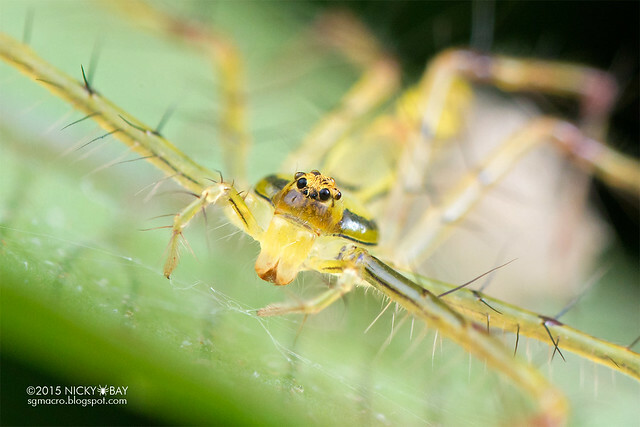 Lots of theridiids were spotted during my walks, but most were poorly identified. 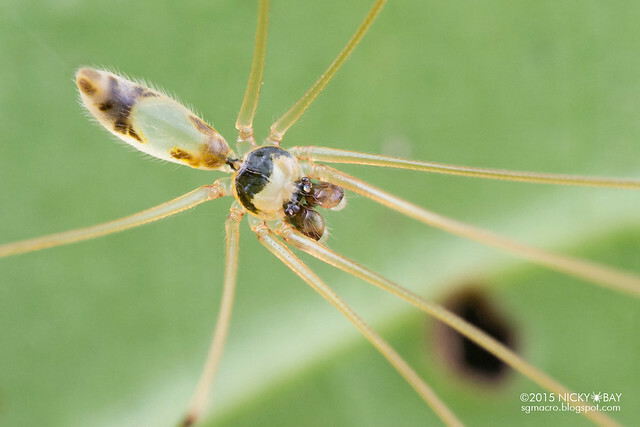 Most of my shots were of the dorsal view as the anterior view of theridiids was inherently less interesting than in other families. Not all of the theridiids that I found are shown here, so view the complete set of theridiid photos from this trip where you can see the diversity of this family. 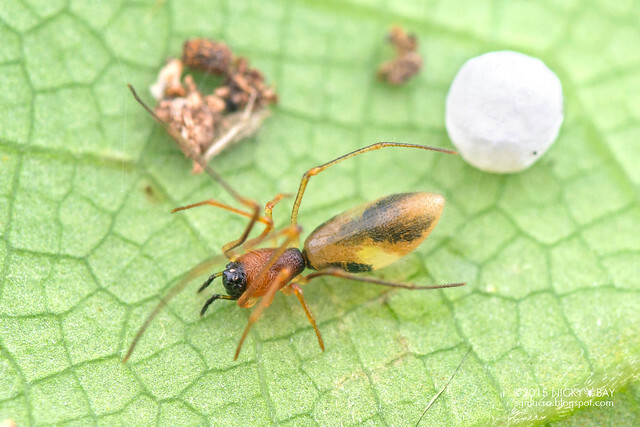 A very small but distinctly coloured genus, this Helvibis had her ice-cream-like egg sac with her. 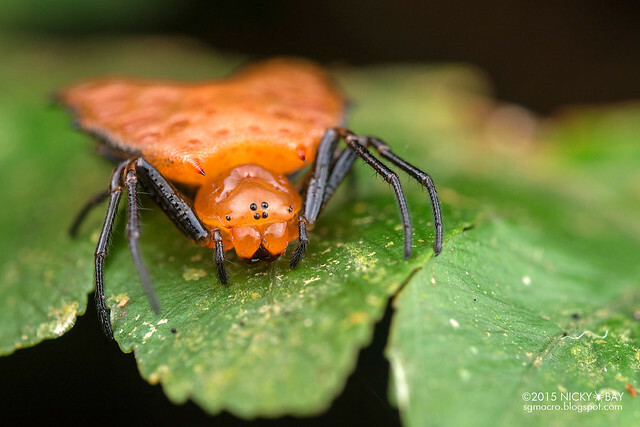 This is the mirror spider of the Amazon. 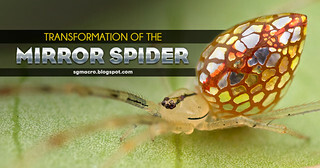 Read more about the one documented in Singapore: Transformation of the Mirror Spider. 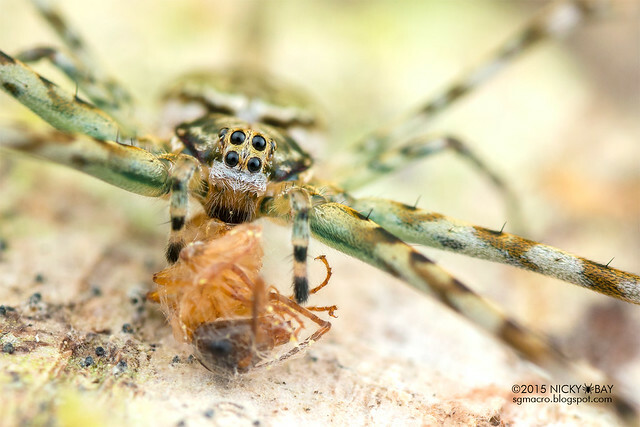 Check out the dorsal view of a male Thwaitesia as well as the lateral view of a female. 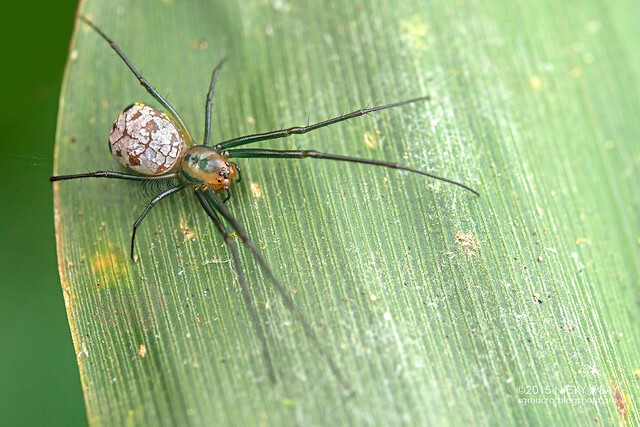 An interestingly large theridiid. No idea which genus! Check out the dorsal view. 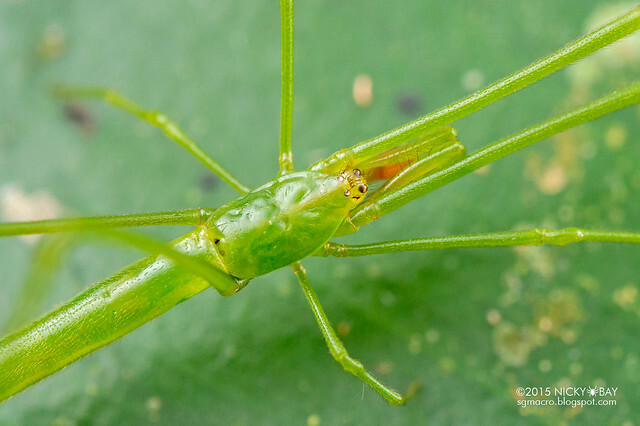 An adult male Ariamnes that mimics a green twig - check out a closer view of the palps and another from the ventral view. 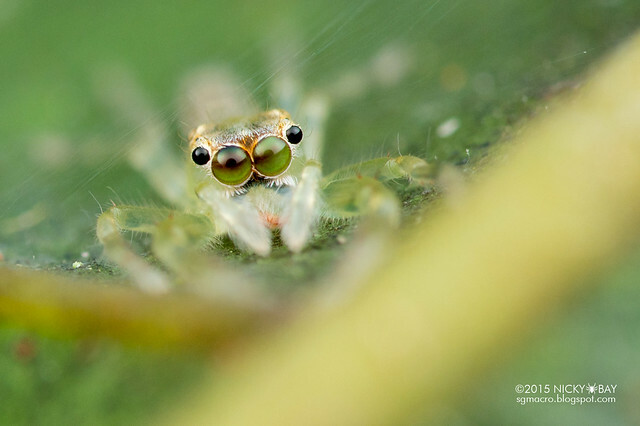 Not seem often, but the web is of particular interest! 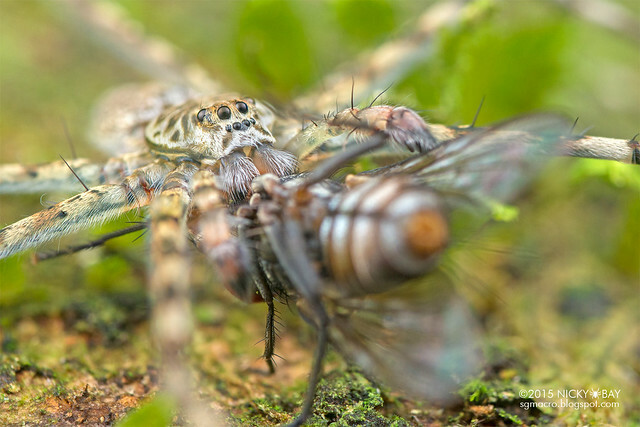 Not exactly a face shot, but this scene shows how the spider stretches its orb web like a slingshot, and propels itself towards the prey when it is detected. 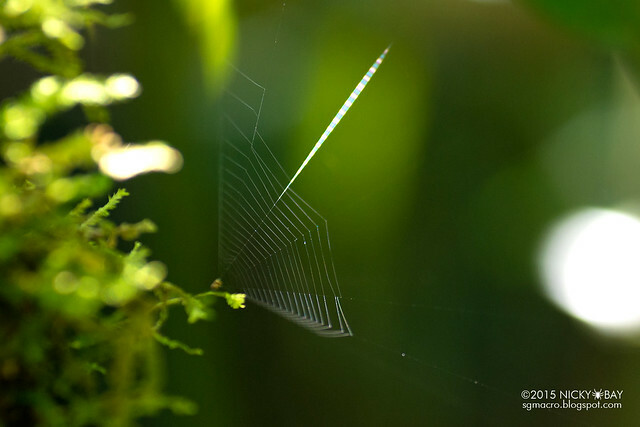 The light I shone on the web attracted some flies and allowed me to witness the slingshot in action! Supposedly a very widespread family. I was very keen to find a Tobias but it has eluded me in this trip. 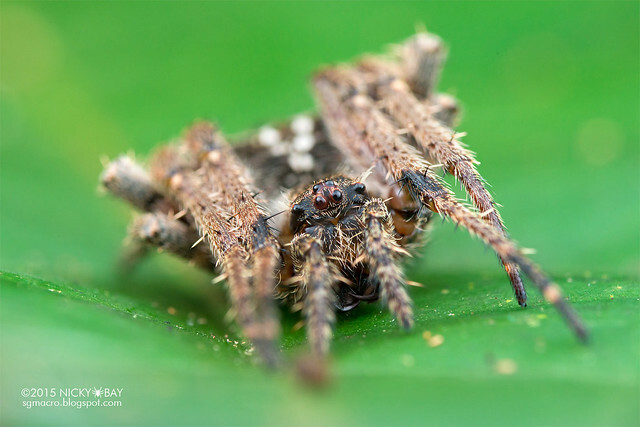 Most thomisids photographed were very small, most sized at less than 1cm. 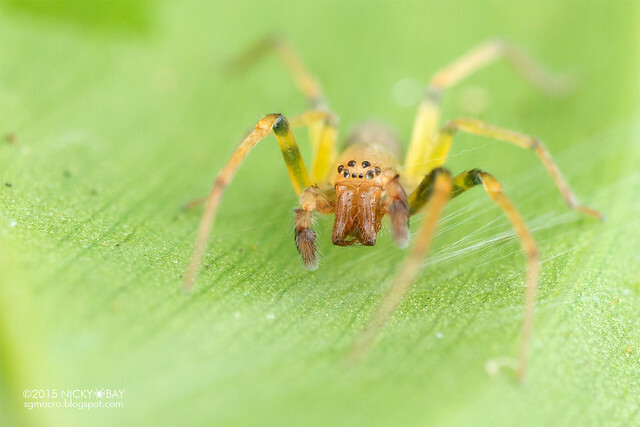 Undoubtedly my favorite thomisid from this trip! 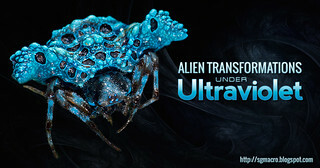 Imagining this to mimic a turtle ant? 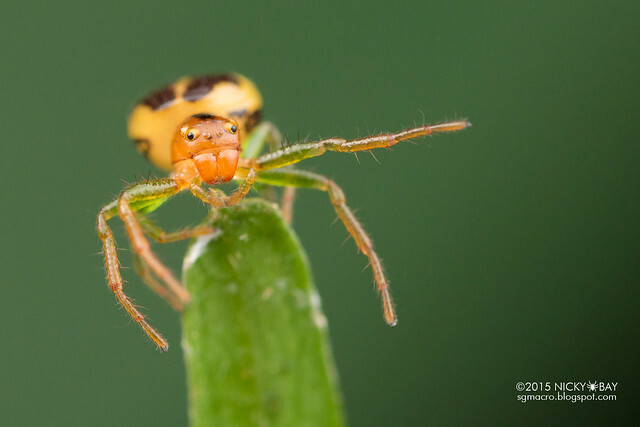 This is sometimes called the dog-eared crab spider and incredibly cute! Check out the dorsal view. Typical pose of a Tmarus. Check out the dorsal view. 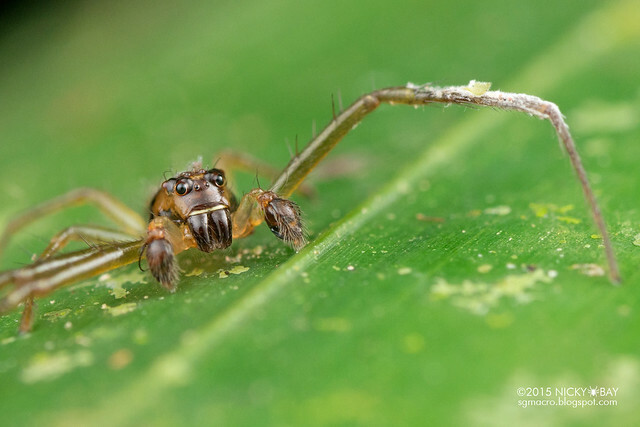 A male thomisid, also very very small. Check out the dorsal view. 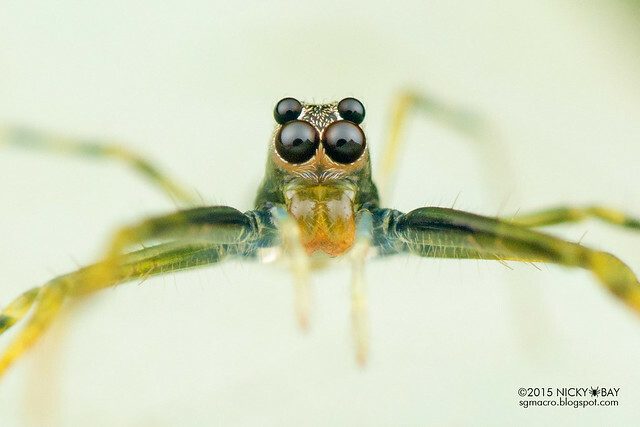 The heightened clypeus gives this thomisid a unique look. Check out the dorsal view. 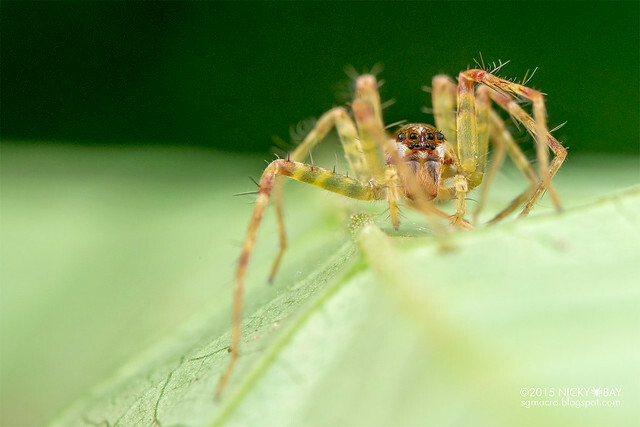 Many were giving me a thread pose, like this sub-adult male thomisid. Check out the dorsal view. An adult male, not easy to get it to stay still! Check out the dorsal view. 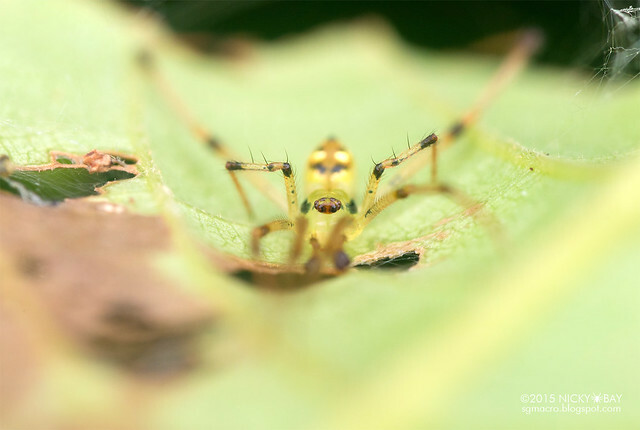 This female was shifting between both sides of a leaf, until a male approached. Check out the dorsal view of her while a horny male approaches from behind. Looks similar to some instances of Synema in Singapore. Check out the dorsal view. 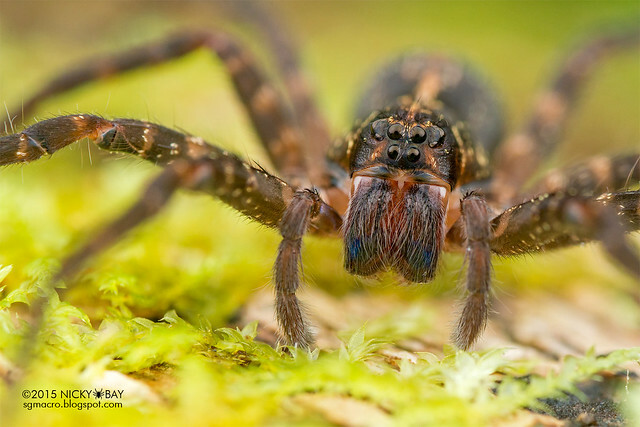 These large spiders are very easy to spot by checking for eye-shine on tree trunks at night. From far, they resemble some species of Pandercetes in Singapore. Despite looking similar to Pandercetes from far, the eye arrangement is very different. 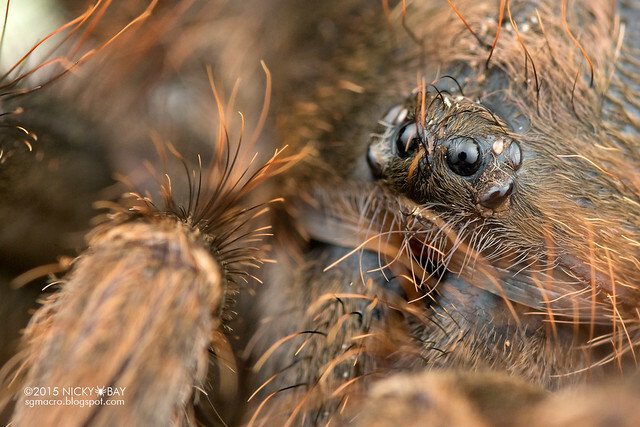 Check out the dorsal view and a closeup, and even a shot of both male and female together. Face of the male! Check out the dorsal view. This also looks like Nilus from afar. Check out the dorsal view. 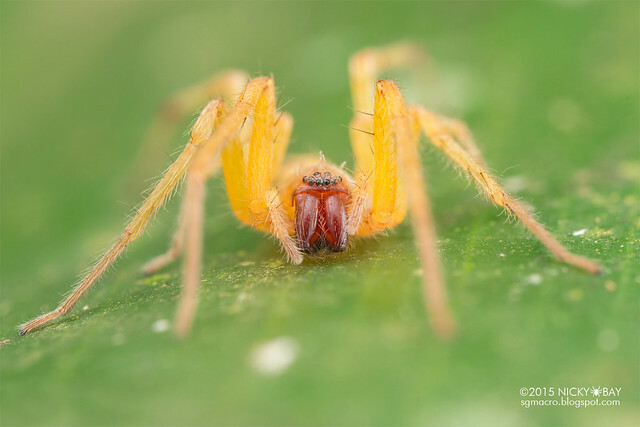 I skipped many of these spiders eventually, as there were really too many of them! 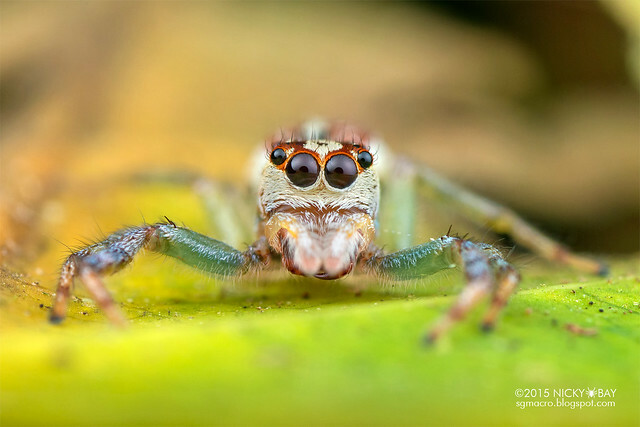 Many uloborids were spotted during the trip, but due to the awkward position of the eyes and potential blockage by the front legs, anterior views are rarely photographed. A beautiful maroon coloured Uloborus. 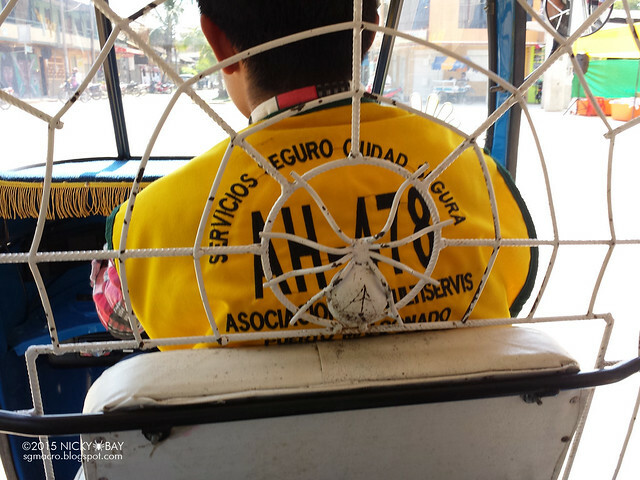 Not sure if it was a coincidence, but I found this on the back of my motor taxi at Puerto Maldonado while heading out for lunch before my return flight. 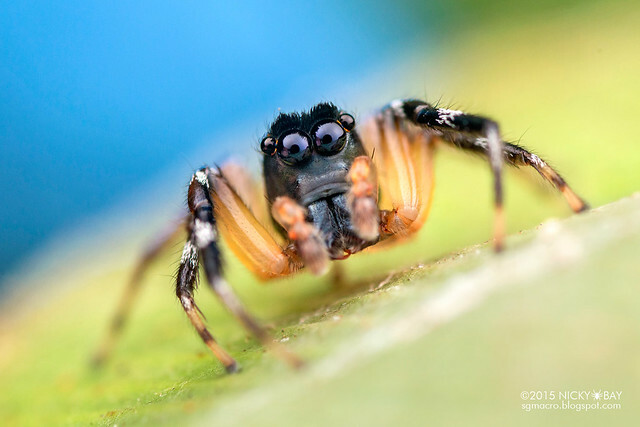 What spider? No idea! 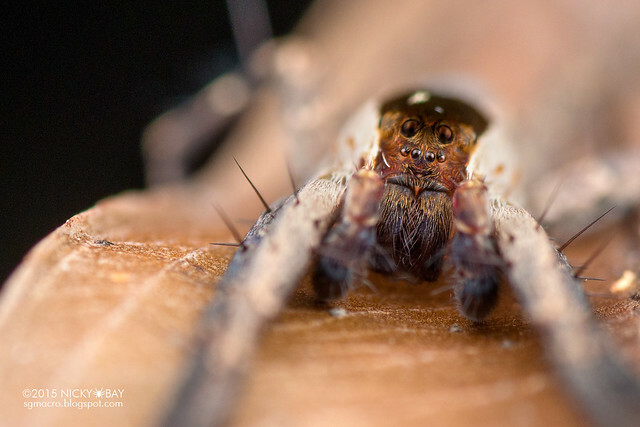 This post contains less than 15% of the spider photos that I have uploaded from this trip, with a focus only on the faces. Remember to check out the dorsal views, which can be equally stunning! Remember to follow my work on Facebook, Twitter or Flickr for the most updated posts! 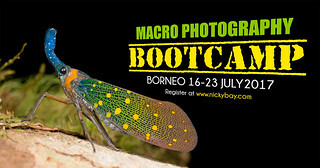 For those who are interested to make trips to Tambopata - readers of this blog can get a 10% discount from bookings to the Peruvian Amazon via Rainforest Expeditions - just mention the discount code SGMACRO when making your reservations!